As anyone who lives here knows, Vietnamese people are serious about good food. Whether it’s the street vendor rolling spring rolls or your aunt making noodles, they carefully blend different flavors and textures to make each bite amazing. 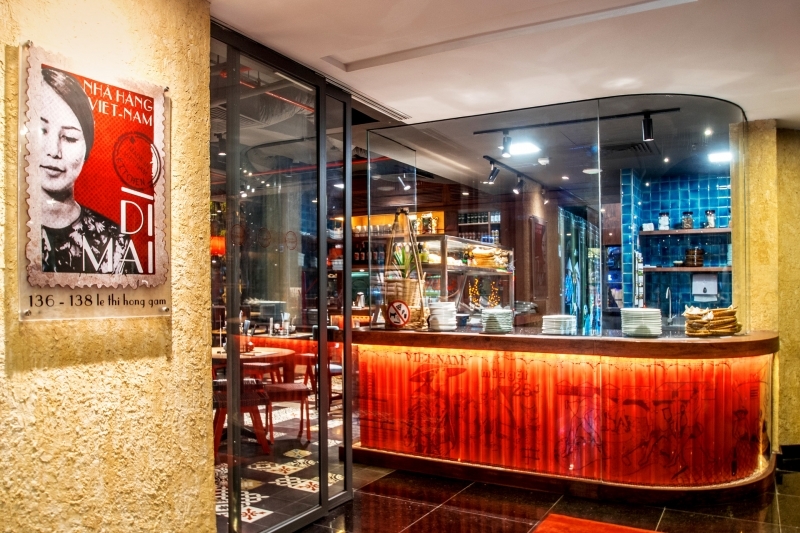 This is the inspiration for Di Mai (translated as “Aunt Mai”, 136 – 138 Le Thi Hong Gam, D1), a new restaurant that celebrates the best of Vietnamese food, from all regions of the country. Traditional street food and family recipes are cooked with the freshest ingredients, and with contemporary flair, by talented chefs. The restaurant’s relaxed yet refined atmosphere invites you to stop in for a quick lunch, or tuck into several dishes as you catch up with family and friends. The decor effortlessly blends vintage memorabilia into a modern restaurant design. Shelves lined with teapots, bottles of soy sauce and cookbooks bring to mind a family kitchen, or perhaps a general store from 60 years ago. Vibrant blue tiles and warm red lampshades echo the dominant colors of the room. In the center, next to one long table is a sky blue xe lam, a three-wheeled taxi with the words “Made in Vietnam” painted on its side. 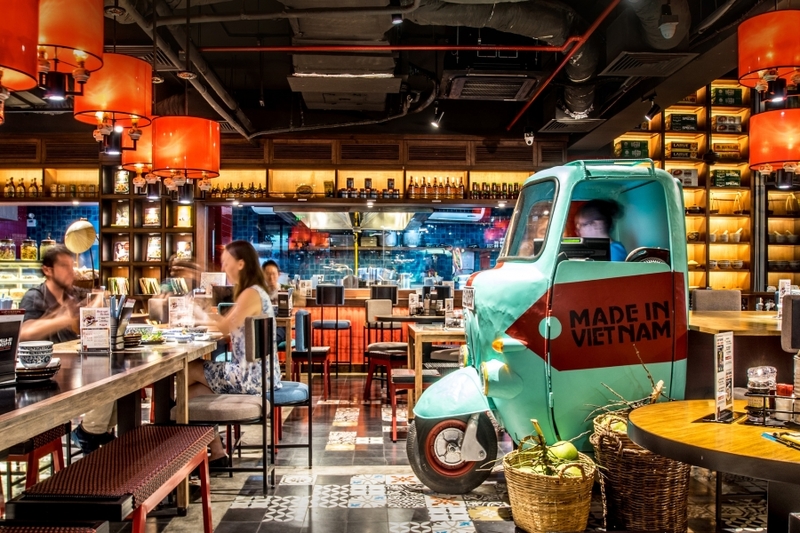 This pride in Vietnamese inventiveness and culture is carried through in the design of the open kitchen. Through a large window, you can watch the cooks chop and sauté your food with effortless precision. As a diner, you are surrounded by food being prepared. On one side is a banh mi and spring rolls station; on the other, a refrigerated case of Vietnamese desserts. Another refrigerator holds fresh fruit for juices, while over by the windows single-origin coffee is brewed through metal filters. We selected fresh juices to accompany our dinner. 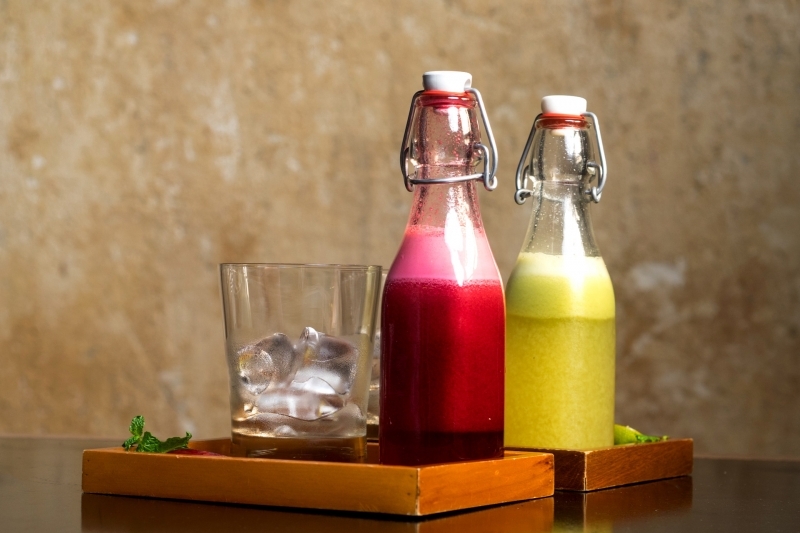 The Detox (VND68,000) is made with beetroot, carrot, apple, pineapple and ginger. It is a lovely purple color, without being overwhelmingly beet-y. The sweetness of the fruit and the spiciness of the ginger balance out each sip. Feeling properly detoxed, we started drinking the Happy Time (VND68,000). This pale green juice is a blend of guava, kumquat, apple and honey. The light floral and citrus flavor was enough to bring a smile to anyone’s lips. The first dish to arrive was the crab claw herb salad (VND95,000). Crab claw herb, or rau cang cua, is a delicate leafy green perfect for salad. Here, it was tossed with strips of tender beef and a cool kumquat dressing. Saucers of chili satay and fish sauce were served on the side for extra kick. Next we admired the grilled rounds of minced pork and betel leaves (VND88,000). 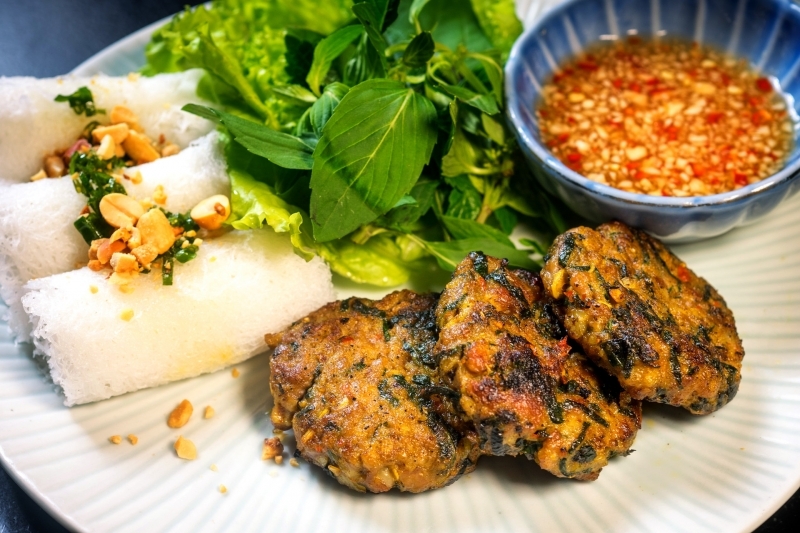 With our waiter’s advice, we cut the meat into small pieces, before wrapping it in fresh herbs and pillowy white banh hoi. Banh hoi is a sheet made of rice vermicelli, so it absorbs plenty of the spicy-sweet fish sauce that you dunk each morsel in before eating. 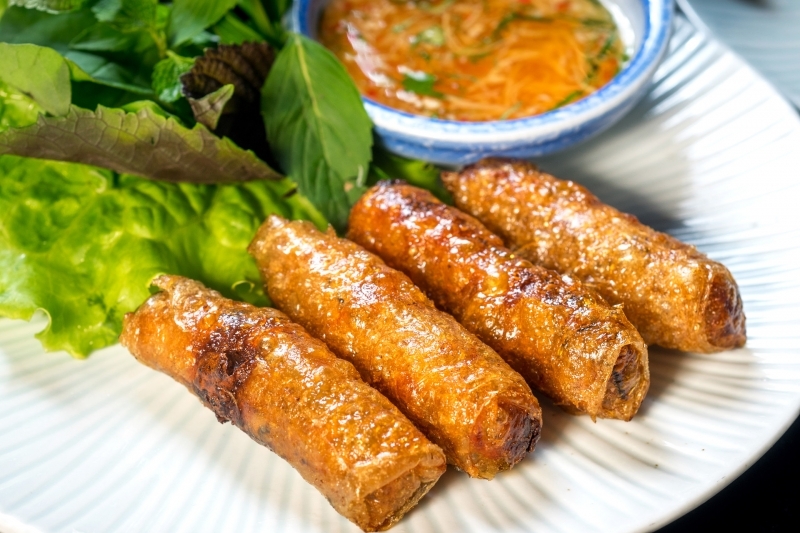 We loved the crispy duck fried spring rolls (VND78,000). Inside the fried shell, slices of duck breast mingled with finely diced wood ear mushroom. Wrapped in herbs and dipped in fish sauce, this is like a bullet of umami flavors: small but powerful. 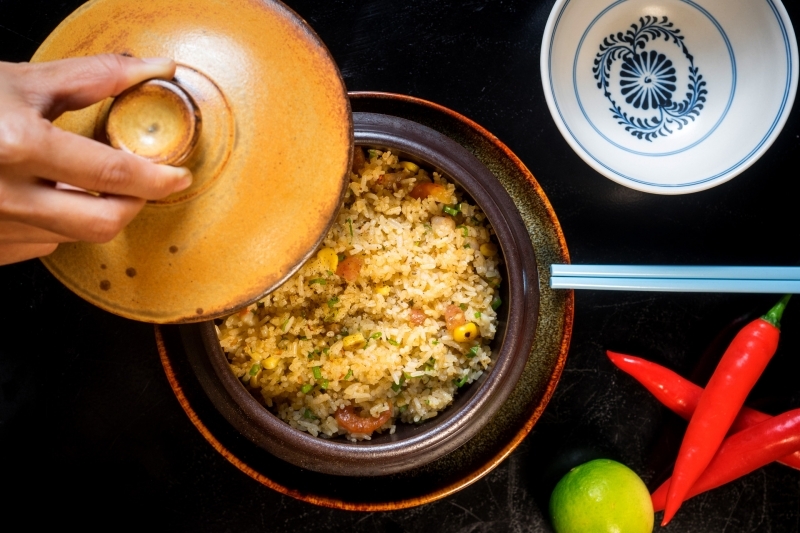 Transitioning to the meaty main dishes, we started with Di Mai fried rice (VND88,000). Nuggets of Chinese sausage and shrimp studded the rice, while chili satay and spring onions livened it up. Best of all, it was served in a clay pot with crispy browned rice on the bottom. 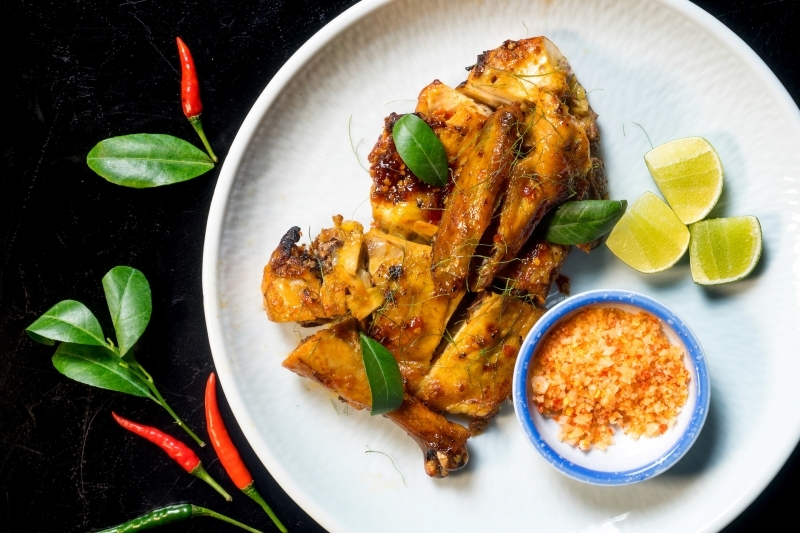 The Di Mai spicy grilled chicken (VND195,000) arrived on a platter. Glorious gleaming slices of glazed and grilled chicken greeted our goggling gaze. This is the Vietnamese answer to chicken wings. Eating the tender meat off the bone, you are surrounded by the scents of barbecue and spice. Next up was a beautiful grilled sea bass fillet (VND95,000). 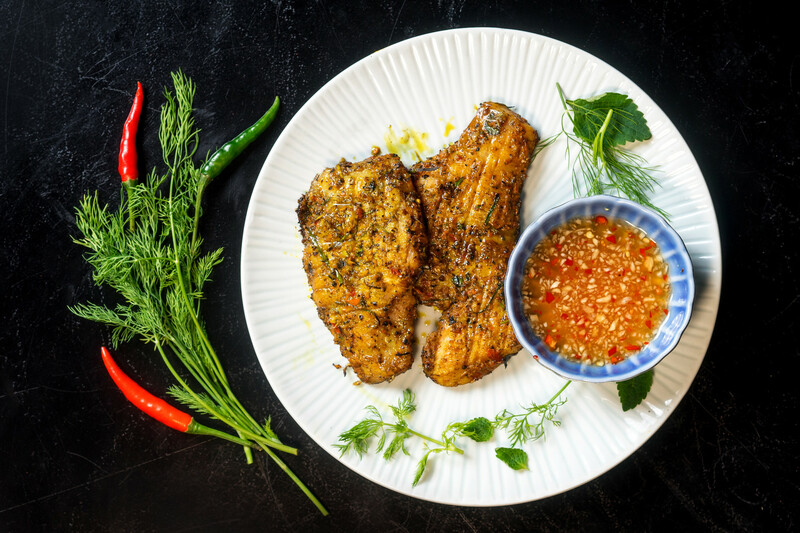 Coated with a rich spice rub of galangal, lemon leaves and chili, the white fish flaked into chunks that quickly disappeared along with the rice. 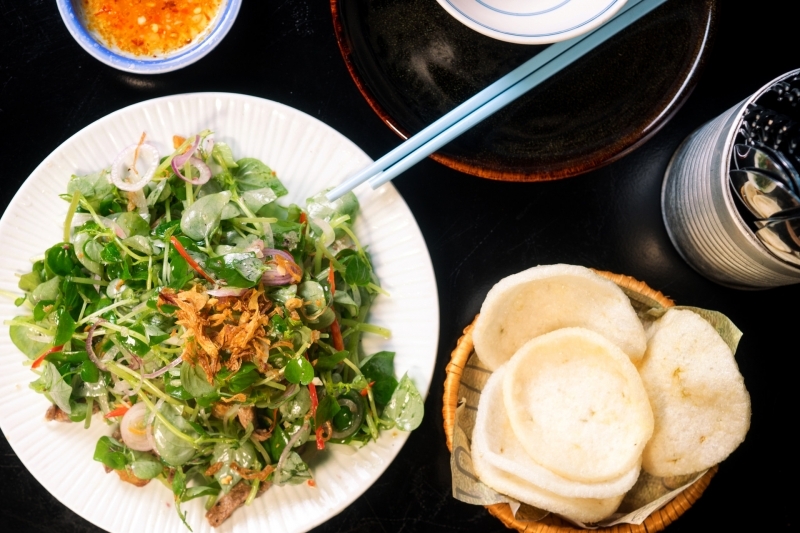 We couldn’t leave without trying a few bites of Di Mai’s take on mi quang (VND 78,000). One of the first dishes we tasted after arriving in Vietnam, these noodles are hard to miss in HCMC. Although cheaper restaurants may use food coloring to make their noodles yellow, Di Mai uses turmeric, as is tradition in Quang Nam Province. 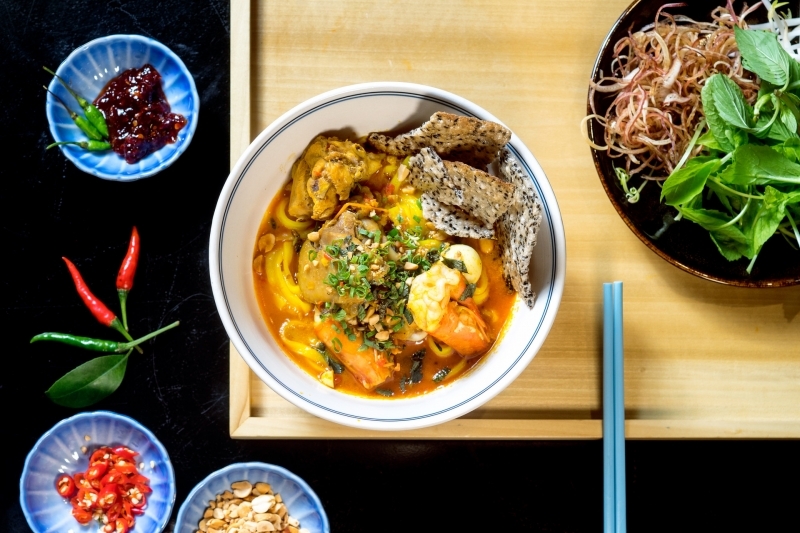 The meaty broth and quail eggs, shrimp and chicken are complemented by fresh herbs and bean sprouts, and crunchy peanuts and rice crackers. Each bite runs the full gamut of flavors and textures, leaving you hungry for more—insuring our return. 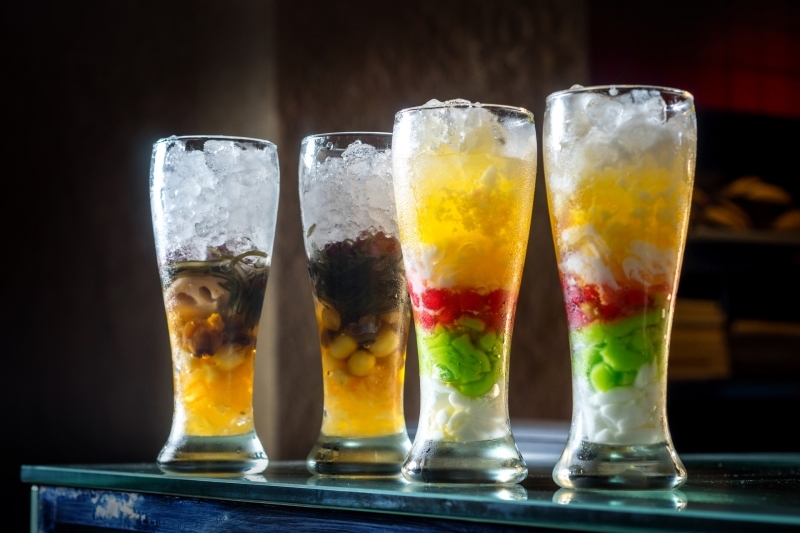 Asif Mehrudeen, with 20 years of experience in Australia, Japan, Bali and India, established D1-Concepts in Vietnam – a food and beverage company that focuses on design, location, high quality cuisine and hygiene. Along with Di Mai, he also owns San Fu Lou and Sorae in District. Went there this evening February 3rd, 2017, right after reading this write-up! The food seemed quite delicious, I will give credit for that. However, there were at least two significant things I noted which were in need of attention. This is a somewhat upscale setting, although the prices were quite reasonable. I spent upwards to 400.000 VND for an appetizer, a main course, and two beers, plus dessert. Very nice! Twice during my visit, with two other tables of guests in a similar situation, the floor waiter/manager decided to hold a staff meeting with all table staff in an obscure corner of the restaurant, out of view of nearly all the tables. For quite a lengthy time, the entire wait staff was glued to give attention to their manager, and no one was giving any attention to the clientele. And after the first session, they re-adjourned a second time and repeated the identical poor behavior! BAD SHOW on the part of the floor manager for deciding to have a crew meeting of all wait staff in the midst of clients wanting to be waited on! I finally had to get up from my table and scold the manager and wake him up to the fact that I was waiting for staff to take a dessert and cheque order. Secondly, PLEASE let’s have a look at the crummy sound track playing on the PA system! In the overall dining experience, everything must be looked after properly. In the case of the music, the first song I noticed was a pleasant, but somewhat uninspired contemporary jazz tune from someone’s garage electronic compilation. On the second song, the music changed just a bit, but the plodding percussion was the same boring, canned electronic beat with virtually no change, same tempo, same boring electronic boredom. Same with the third…..and the fourth….and the fifth. There was no musical imagination and almost no variation whatsoever, as if the sounds were purchased at a bargain-basement price from a Taiwanese huckster who was barely scraping by to make payments on his motorbike.